Sounds Of Metal Records is a new Spanish record label that has decided to release some of the old albums of the Spanish metal scene. Their first release is the album of the Spanish metal band Thor. It is rumoured that the next release of the label will be the only album of the mighty Exodo, “The New Babylon”!!! 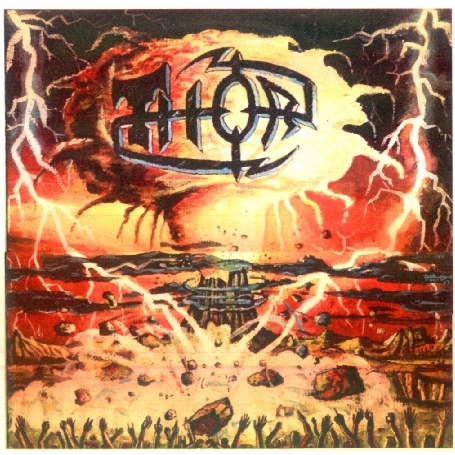 Thor was a heavy/power metal band from the Basque Country. Their town was San Sebastian (where Real Sociedad is placed). The band released a demo in 1985 and two full length albums. Their debut & homonymous album was released back in 1987 by the record label Discos Suicidas while their second album “Mata a la Bestia” (“Kill the Beast”) was released by the same record label in 1989. This re-release contains an 8 page booklet and it has been re-mastered. Fortunately the really great cover of the original album is maintained. There isn’t a bonus track and as far as I know it isn’t limited. “Mata a la Bestia” has also been re-released by Sounds Of Metal Records. Here I should also mention that a few years ago the two albums of THOR were bootlegged in one CD. The musical style of the album is strong heavy/power metal mainly with high-pitched vocals from Luismi. THOR’s songs are in Spanish but this shouldn’t prevent the friends of high quality traditional metal from hearing them… THOR has a really great guitar work but their great advantage is their high quality song writing!!! “No Puedes Perder” (“You Can’t Lose”), “Debes Attackar” (“You Must Attack”), “Desertor” (“Deserter”), “Perro De Alquiler” (“Dog for Hire”) and “Ella Es Asi” (“She Is Like That”) are really great heavy/power metal anthems. The rest of the tunes of the album (“La Ley de la Fuerza” – “The Law of Power”, “Y Te Encontre” – “I Meet You”) are also good metal songs. One of the characteristics of this album is that the tunes are catchy. Even though I had a couple of years to listen to this album (because of the plethora of traditional metal releases – old and new) I remembered at once the songs and I was singing them (I know a bit of Spanish). So far I haven’t mentioned the best song of the album in order to dedicate a special paragraph for it. The song is named “Excalibur” and the lyrical content of the song is obvious. Its duration is 6 and half minutes. “Excalibur” is a REAL EPIC/POWER METAL HYMN!!!!! If the song was sung in English by a known band it would be considered one of the greatest metal songs!! The song enters with a really atmospheric intro and with a recitation in Spanish. After 1:15 it transforms into an epic/power metal hymn with a really monstrous guitar work! At 3:27 the song makes a little “break” with a really epic interlude where there is also a recitation and after 3:52 the song returns to its pre-break motive. Except for the really astonishing guitar work and the really beautiful epic melodies the song has exceptional vocal lines and a fantastic vocal performance by Luismi. In conclusion for me their debut album is by far the best Spanish spoken album, and one of the best traditional metal albums in general.